Braganca is situated right on the edge of the Montesinho Nature Park in the north of Portugal. Only 22km from the Spanish border It is also the capital of the province of Tras-os-Montes. Its history actually goes back to the prehistoric Paleolithic period with many of its original settlers surviving on agricultural and livestock farming. However, over the centuries it became quite a thriving, important medieval town which thankfully has changed very little over time making it quite special. By the middle of the 13th century it was divided into four parishes. During the Inquisition many Jews fled to Braganca for sanctuary, as its remote location meant they were tucked out of harms way. The town flourished during this period and as a result many of the churches and convents underwent major renovations. However, by the end of 15th century the King reinstated the Braganzas, which were an important noble family, and forced them to expel any Jews that would not convert to Christianity. As a consequence hundreds of the town's inhabitants departed, taking their money, contacts, and merchant expertise with them. When the monarchy was eventually dissolved in the 17th century Braganca became the seat of the Royal House of Braganca, who ruled the country for the next three hundred years. The feudal castle which was built in 1187 still stands today and if you climb to the top of the Keep you will get marvellous panoramic views of Spain. The Keep also contains a Military museum with exhibits of medieval armour and weapons. One of the castle towers was named the Princess Tower in honour of the wife of the Duke of Braganca. The Duke had accused her of adultery and locked her up in the tower before eventually having her murdered. There are several places of interest to see in Braganca. The Domus Municipalis is actually the oldest Town Hall in Portugal and one of the few remaining Romanesque civic buildings to exist in Europe. The 16th century Cathedral of Sao Joao Baptista is known for its painted panels that tell the life story of the Jesuit Order's founder. Overlooking the town is a 12th century Citadel built by the Benedictine monks and stands on a hilltop. Also worth visiting is the 18th century Church of Santa Maria with colourfully painted ceilings. For those who enjoy archaeological museums, one of the best in Portugal is the Abade de Bacal Museum inside the Bishop's Palace which is located between the Citadel and the Cathedral. The museum has exhibits of ancient artefacts that include ceramics, sacred art, and Roman funeral stones. The Gothic Pillory in the town square is another site worth seeking out for at the base of it is a wild boar carved out of granite by the Celts during the Iron Age. It is believed the Celts used it during fertility ceremonies. Braganca, like so many villages in this area, strongly hangs on to its traditional way of life, and one such tradition is held in the market square once a week with a market selling fresh produce, crafts and clothing. However, some of the more remote villages near the border of Spain will definitely transport you back in time. 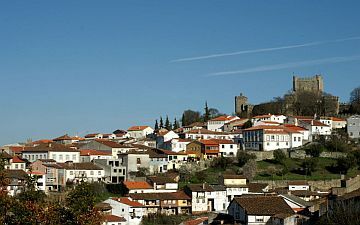 Two such villages are Rio de Onor and Miranda do Douro. Here the people have developed their own dialects mixing Portuguese and Spanish, and ancient traditions still carry on with women washing down by the river and donkeys used as transport. For those who enjoy outdoor activities this area has many, including hunting, fishing, biking and horseback riding. As mentioned earlier, Braganca is on the edge of the Montesinho Nature Park covering a vast area of 75,000 hectares. This protected area is one of the wildest parks in Europe, with immense forests inhabited by wolves, wild boar and birds of prey. There are also several tiny villages dotted throughout the park providing refreshment for the many hikers that pass through. Spring is a particularly special time to visit because this is when the valleys are covered in almond blossom. The province of Tras-os-Montes also celebrates carnival season at this time of the year, with lively parades and traditional music attracting visitors from all over the world. 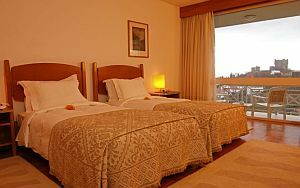 So should you decide to visit Braganca, take advantage of the fact the town also has one of Portugal's Pousadas which are a chain of excellent hotels. The Pousada Braganca (Hotel Sao Bartolomeu) not only has its own swimming pool and restaurant serving delicious local and regional dishes, but many of the rooms have their own balcony looking down over the town below.